Day 01 CASABLANCA Arrive and be welcomed at the Mohamed V Airport. You will then be assisted and transferred to Casablanca for check-in. Dinner and overnight at the hotel. 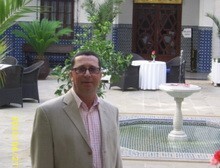 Day 02 CASABLANCA – RABAT – FES Have your breakfast at the hotel before you go to meet with your guide. For your tour in the economic capital of Morocco, you will be visiting Mohammed V Square, the Central Market, Habbous District and the Residential District of Anfa and Ain Diab. Bab Mansour.You will also visit the Royal Stables of Moulay Ismael, the Medina and the Jewish Quarter. Then it’s off to Fes. Dinner and overnight at the hotel. Imperial Cities, founded in the 8th century by Moulay Idridd II. 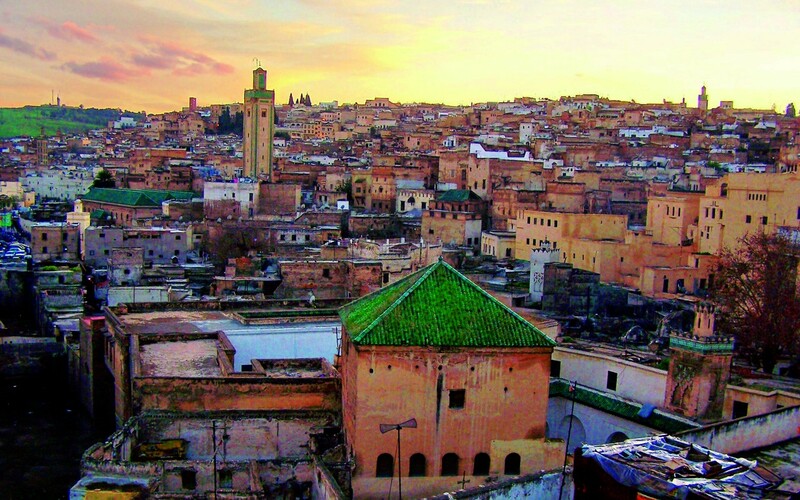 You will be visiting the medieval Medina with its Attarine and Bou Anania Medersas (religious Islamic universities), the Nejjarine fountain, the Moulay Idriss Mausoleum and the Karaouine Mosque. You will then have your Moroccan lunch at a traditional restaurant in the medina. In the afternoon, you will be going to the Medina Fez. Dinner and overnight at the hotel. Day 04 FES / MIDELT / ERFOUD Depart for Erfoud via the mountains and the cedar woods of the middle Atlas passing by Ifrane, a charming ski resort and Azrou, an important handicraft center. Stop in Midelt for lunch before continuing on to Erfoud via Errachidia and the Ziz valley filled with palm trees, which are the source for the yearly Date Festival in Erfoud. 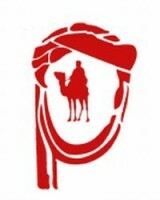 Then take a jeep excursion to see the sun shine over the sand dunes of Merzouga. 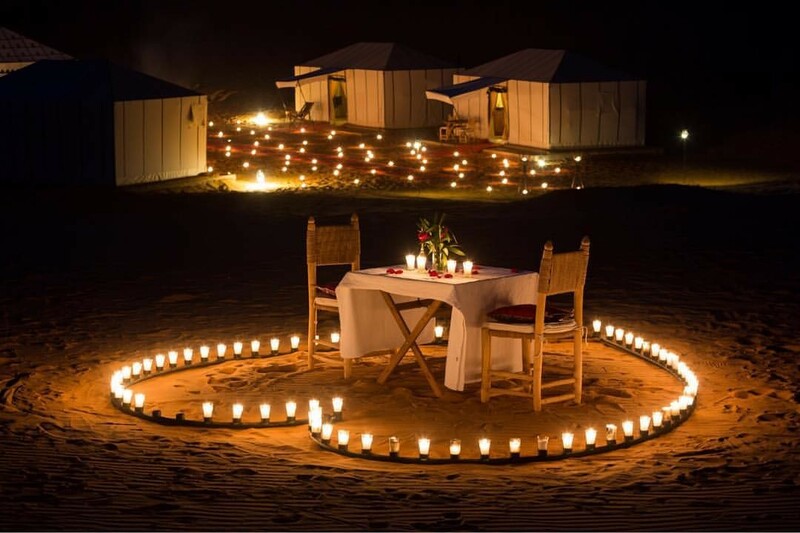 Have your New Year’s Gala Dinner and overnight in Bivouac. 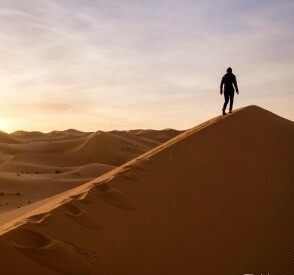 Early morning, take a jeep excursion to see the sun rise over the sand dunes of Merzouga. Go back to the hotel for breakfast and then continue to Rissani, the holy city where Moulay Ali Cherif, ancestor of the Alaouite dynasty is buried. Visit the kasbah of the 17th century and the Ksar Abbar ruins and continue to Tinghir via the Tinjdad road. Visit the magnificent Todgha canyons which reach an altitude of 250 meters. Have your lunch at a restaurant situated at the feet of the canyons. 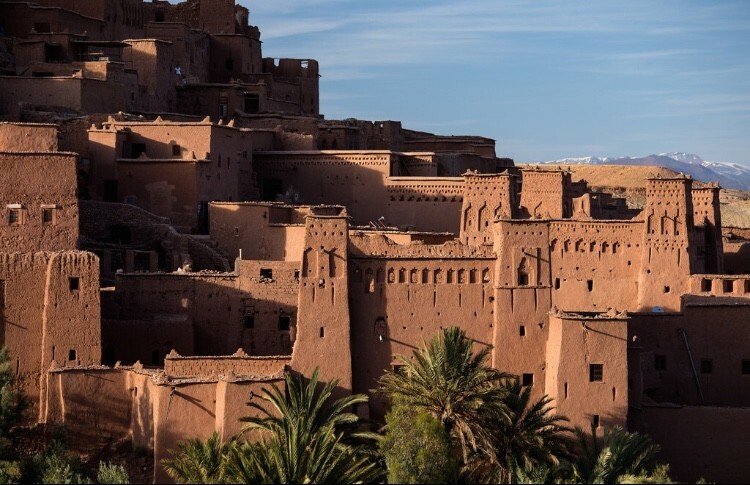 After lunch, depart for the Dades canyons for a visit and then continue to Ouarzazate via the road of the thousand kasbahs and the Dades valley, famous for its roses and the yearly Moussem (Rose Festival). Visit the kasbah of Taourirt before returning to the hotel for dinner and overnight. The entire day will be devoted to Marrakech, the second oldest Imperial City, known as the pearl of the South. The city was founded by the Almoravides at the end of the 11th century. Your historical sightseeing tour includes the Menara Garden, the Saadian Tombs, the Bahia Palace, the Koutoubia and the Dar Si Said Museum. Have lunch at the hotel before continuing on to visit the souks and handicraft quarters displaying a variety of items in the afternoon. Visit the famous Djemaa El Fna as well, with its non-stop entertainment. Dinner at Ali Restaurant with Fantasia Show (optional, not included in tour price). Overnight at the hotel. Transfer to Marrakech airport. You will be assisted by our staff with your check-in and departure formalities. End of service.